Scenic Ride • Complimentary Breakfast • Music • Ride Shirts • Pins - We will also have a drawing Giveaways! Registration will start at 9:00 AM, and line-up will begin at 10:30 AM. Participants may also pre-register online here. Whether you chose to register the day of the event or ahead of time, the registration fee is $25 per bike. All proceeds benefit and go directly to BackStoppers. For additional information, please contact Tom Hansen at tomhansen@mungenast.com or by calling (314) 649-1267. The 14th Annual Dave Mungenast Sr. Memorial Bike and Badge Ride was a great event with more than 250 riders enjoying a beautiful day of fun in the sun while raising $25,000 for the St. Louis BackStoppers. Over the last 13 years, $300,000 has been raised for the organization. We want to thank all of you who helped and rode with us to support such a worthy cause. Please keep the families of the fallen police and firefighters in your prayers. Originally known as the Bike and Badge Ride, organizers have renamed the ride to honor Mr. Dave Mungenast, Sr., a man who believed in his community, often helping many charities without expecting recognition. His support for the Bike and Badge Ride was no exception, and without his help, our ride would not exist today. Mr. Mungenast passed away in the fall of 2006 and we hope to honor him and his memory by renaming this event to "The Dave Mungenast, Sr. Memorial Bike and Badge Ride". This year's event is on Sunday, September 22, 2019 and registration will be taken on-site from 9:00 a.m. to 10:30 a.m. at the ride, which begins at Mungenast Motorsports (located at 5935 South Lindbergh Blvd. directly behind Mungenast St. Louis Honda). Registration is just $25.00 and all proceeds benefit the BackStoppers. T-shirts, sweatshirts, and ride pins will be on sale during the time of registration. To participate in the ride, you will need a street legal motorcycle, valid motorcycle license, and a desire to ride with fellow enthusiasts for a noble cause. Feel free to contact us with any questions. We must remind all participants to not drink and drive. It is against the law and could cause serious injury to you or someone else. If you are a non-rider, please feel free to join other participants in the beautiful Arcadia Valley. 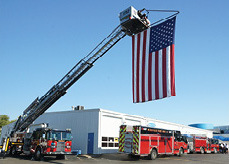 Since 1959, the BackStoppers have served the families of police officers and firefighters in the St. Louis area who have perished in the line of duty. The BackStoppers have but one purpose: to ease the suffering and provide much needed financial assistance for the spouses and dependent children of these public servants who have lost their lives. The BackStoppers depend heavily on donations and support from the community, and this ride is another effort to help and show appreciation for the critical work of this organization. To participate, all you need is a street legal motorcycle, valid motorcycle license and a desire to ride with fellow enthusiasts for a noble cause. Download the registration form here, follow the directions and mail the form in. 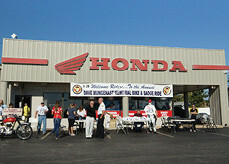 In person at Mungenast Motorsports (located at 5935 South Lindbergh Blvd. directly behind Mungenast St. Louis Honda) before or on event day Even if you don't have a motorcycle, you are more than welcome to attend our post-ride gathering. Again, we must remind all participants to not drink and drive. Not only is it against the law, it could cause serious injury to you or someone else. 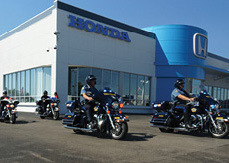 Thank you for supporting The BackStoppers by making a donation in the name of the ride. We offer several levels of sponsorships. If you are interested in showing your support, but not at the listed levels, please feel free to use this form also. All donations (no matter the size) are welcome. All Corporate Level Sponsorships will be recognized and presented with a professional plaque proudly displaying your organizations name and level of sponsorship as well as your logo displayed on the event page linked directly to your website. All Business/Personal Level Sponsorships will be recognized and presented with a professional plaque proudly displaying your name or your organizations name and level of sponsorship.